Oh For Sweets Sake takes two of the most saturated OC trends – cupcakes and food trucks – and manages to make both work quite well. OFSS is actually one of our favorite food trucks, but this is the first time our cupcakes survived long enough for picture taking. As it happens we were purchasing a half dozen to take home for sharing. 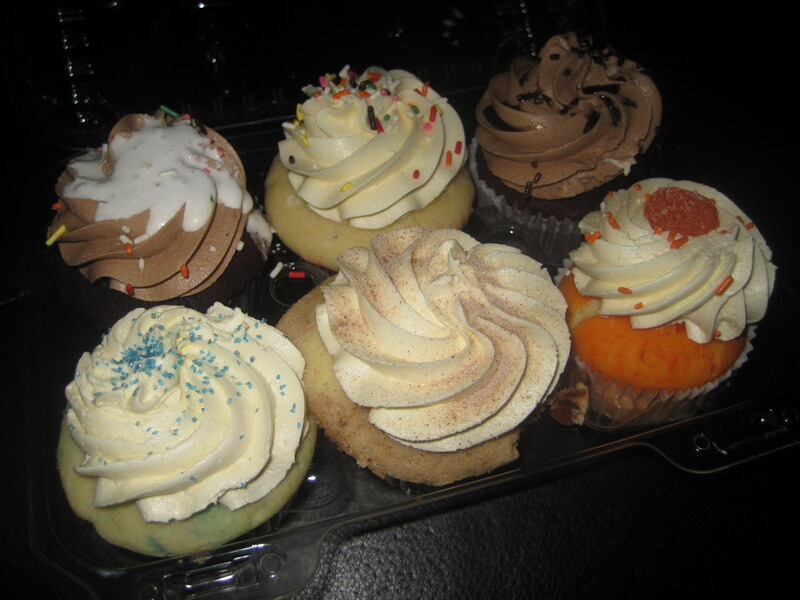 This also means that instead of just picking up one cupcake apiece from our favorites, we got a wide variety to try out. Chocolate marshmallow – I can’t remember the exact name, but this was a more chocolate take on their S’mores cupcake, which is our daughter’s favorite cupcake ever and a big reason we stop by this truck when it happens near us. The marshmallow fluff is quite tasty, making this cupcake seem like a more refined version of those Hostess cupcakes. Birthday Cake – Just like it sounds. Tasty but not much exciting happening here. Not bad if you might have a picky eater and you’re getting a box to go, though. Chocolate Overload – These crazy little bundles of chocolate goodness are pretty commonly found on the truck (they rotate their flavors daily so this is a plus). Very decadent, but not too overwhelming. 50/50 – This is the cupcake I hunt down this truck for. I love the flavor of citrus and baked goods, and this cupcake reminds me of 50/50 bars, which are also a personal favorite of mine. The little candy orange slice is a nice touch. Snickerdoodle – I was excited to see this on the truck because I am also a fan of cinnamon baked goods, but it was a little dry and didn’t have enough cinnamon flavor for my taste. No one else finished it either, so I think I’m not alone on that one. It needed, like, a cream center or something. Vanilla Madness – Our old trustworthy friend vanilla. It isn’t all crazy creative like the 50/50 cupcake, but it’s good, and unlike the 50/50 cupcakes, they usually have them on the truck no matter when you go. At $3 a pop, these are more in the “an alternative to Sprinkles” category than a replacement for the local grocery store baked goods (or a Hostess cupcake for that matter), but for unusual flavors or a decadent treat these hit the spot. We’re most likely to stop by the truck at the end of one of those big food truck events, because there is no waiting, and we know we’ll get something yummy for our $3.